Red Croft is a most attractive family home of traditional style carefully extended and considerably improved by the present owners to create a quite stunning property offering spacious and well planned accommodation taking great care to retain the property's original character features whilst providing large open plan modern living spaces with good quality fittings throughout. The vestibule entrance leads to a dining hall with double doors to a beautiful lounge. There is also a good sized study which could be utilised as a play room. There is a spacious informal sitting room which opens onto the magnificent kitchen/dining/family room. The property also offers a utility room, cloakroom and boiler room. To the first floor, there are five bedrooms including two suites each having a dressing room and en-suite bathroom, three further bedrooms and family bathroom. 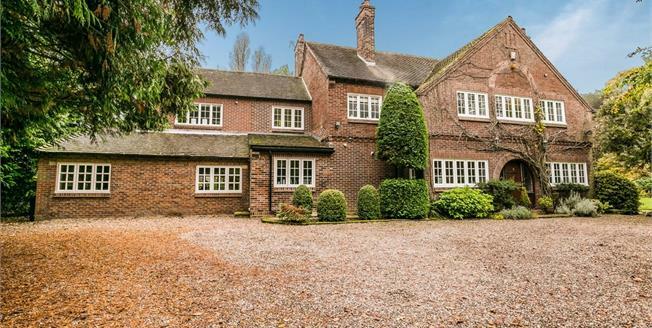 Situated on the outskirts of Willaston Village, the property enjoys a high degree of seclusion. It is also convenient for an excellent range of amenities available in the surrounding areas. Willaston offers local shops with more comprehensive shopping facilities available at Heswall, Neston or Bromborough. Schools, sporting and recreational facilities are available in the area. The property is well placed for commuting to the major commercial centres of the region including Chester, Liverpool and Manchester via the M56 motorway. Rear Lounge 20'10 x 15'4 With Inglenook recess with stone Minster style fireplace, deep bay window with French doors leading to the garden, two lead light rear windows and central heating radiator. Study/Play Room 18'10 x 11'8 With doors to both the sitting room and inner hall, wood block floor, central heating radiator and fireplace. Kitchen/Breakfast/Family Room 29'4 x 23'1 Superbly fitted with a good range of modern units in a woodgrain finish with granite work surfaces including a large central island unit incorporating a breakfast bar, two inset stainless steel sinks, an excellent range of integrated appliances including twin ovens, gas and electric hobs, down lighters to ceiling, tiled floor, central heating radiator, windows to the front and side and French doors leading to the rear garden. Cloakroom/WC With WC and wash basin, part tiled walls, two windows and central heating radiator. Utility Room 12'10 x 9'6 With Belfast sink, built-in cupboards, plumbing for washing machine, double glazed window to the front, tiled floor and stable door. Boiler Room With twin central heating boilers, hot water cylinder. Landing With window to the front. Master Bedroom 21'4 x 15'7 With Inglenook recess and traditional style fire surround with tiled inset, bay window overlooking the grounds, central heating radiator. Dressing Room 12'2 x 6'8 With an excellent range of fitted furniture, side window. Bathroom Beautifully fitted with a suite by Duravit comprising bath, separate shower cubicle, wash basin and WC, tiled walls and Amtico tiled floor, two windows, down lighters to ceiling, central heating radiator and heated towel rail. Dressing Room 15'1 x 9'2 Fitted with an excellent range of fitted wardrobes, windows to the side and rear. Bathroom Fitted with a suite in white with chrome fittings comprising bath and shower cubicle, wash basin and WC, tiled walls and tiled floor. Rear Bedroom 3 14'2 x 12'1 With window to the rear and central heating radiator. Front Bedroom 4 15'6 x 11'8 With window to the front and central heating radiator. Bedroom 5 10'10 x 9'0 plus 3'3 x 6'0 An L-shaped room with windows to the front and side, central heating radiator. Bathroom Beautifully fitted with a suite in white with chrome fittings comprising a bath in a tiled surround, twin wash basins in vanity units and WC, part tiled walls, window to the front and central heating radiator. The property is approached through a twin pillared entrance with automatic gates leading to a gravelled driveway providing parking and turning for several vehicles. The property is set in mature grounds providing a delightful setting for this fine property with extensive lawns, beds and borders containing a profusion of mature shrubs, trees and bushes. There is a well screened 'secret garden' to the front and patio area to the rear, golf practice area with astro turf putting and two pitch positions.